Once a week I post interviews with interesting designers about their insights on their experience of working in the Knitting industry. I’ve noticed that every designer makes their living in a slightly different manner bringing their own unique presence to the Knitting world. Dorothy gets a special mention because she was kind enough to spend time talking with me last year while I was in the process of making the decision to pursue my own knitting career. You can find Dorothy here http://www.fiddlesticksknitting.com/ and here http://www.ravelry.com/designers/dorothy-siemens on ravelry. I like to look through knitting, fashion and home decor magazines. If I'm shopping, I'll check out the fashions to see what's in style or get ideas for shaping. Sometimes I'm inspired by nature, such as with my Fern Glade Shawl. I've been known to pause a TV show to get a quick photo of a garment worn by one of the actresses! All of these ideas and influences percolate in my head, so I often seem to get ideas right out of the blue, but I know that my subconscious has probably been thinking about it for awhile. It's probably obvious with my designs - lace, of course! I try to provide as wide a range of sizes as possible, but much depends on the pattern or repeats of a particular design. Therefore, even though I use standard sizing charts, my designs will vary in the way they're sized. Shawl and scarf designing is easy as there is only one size necessary for the most part. Yes, I do look at other designers' work. I often find it inspirational (or envy-making - why didn't I think of that?). I never use another designer's idea but it can become a spring-board for my own ideas. I design what I like to knit and wear myself. 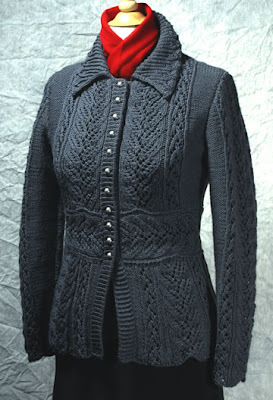 I consider myself an experienced knitter, so many of my designs reflect that. When I do something simpler, it is because I crave a simple, meditative project for myself. I think it is very important for knitters to challenge themselves with increasingly complex projects, as that is how we learn, and that is how we get to the point where we can tackle those "oh, wow!" projects. I now knit all my samples myself. I find that I often make changes as I work, so that gives me more control over the project. I don't have so many things going at once that I need to use a sample knitter. Plus, I love knitting the samples myself! No, I didn't. When I got started, it was as a side-line to my graphic design and illustration business. I went into it thinking that if it brought in a bit of extra money and was fun to do, that was fine. As the business grew, I took steps that made sense at the time. I am still rethinking my business all the time, and find that in this competitive climate, you have to be able to be flexible. Not any more. But I would say that people who helped my get started and taught me important things in knitting were Sally Melville, Fiona Ellis and Margaret Stove. I would not have this business without the Internet - it is crucial. Always, on every pattern. Since I knit all my samples myself and then write up the patterns, it is absolutely necessary to have another set of eyes go through the pattern with a fine-tooth comb. My tech editor makes sure all the measurements work, the math is correct, and the charts are error-free. I rarely publish a pattern with an error, although it can happen. But the likelihood is greatly reduced. I take care of business on weekdays just like a regular office. I have been in that habit for years because I have been self-employed for so long. I confess though, that evenings are for sample knitting. You can't run a business and do all that knitting in eight hours a day! It's difficult, although it doesn't happen often, thank goodness. I have an artist's ego, which means that even though I am pretty sure of myself, I can be hurt when someone criticizes my design - it is like they are criticizing me! But you just shake it off and move on. Support myself? Are you joking? Thank goodness my husband makes a decent living! Okay, some years are better than others, and I could just manage to scrape by if I had to, but the truth is, you don't get rich being an independent knitting designer. If you are going to be an independent designer like myself, then be prepared to be poor unless you have another source of income, or you work very, very hard. When you make your hobby your work, it becomes just that - work. Fun work, but work nonetheless!